I've already discussed how to make the most of your vouchers (tavim) , either the ones you get at work or those you receive filling out surveys. 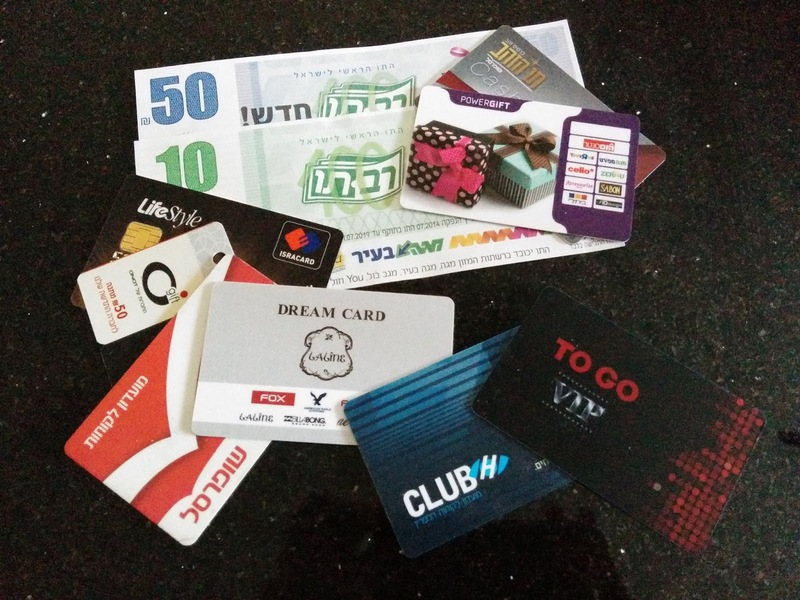 Chances are, you also have one or more membership cards for a variety of chain stores. Have you ever left a store after shopping and paying full price, only to remember you have vouchers or discount cards you could have used...but now it's too late, or you left the cards in your other purse/desk drawer/wherever? I know I have, way too many times. See, the most important rule about vouchers and benefit cards is...you need to remember to use them! While the app that whispers "Psssst..." in your ear when you approach the cash register has yet to be invented, here are a couple of apps which can help you use those membership cards and vouchers. When it's being offered free of charge. If someone's giving me a freebie, no strings attached, I take it. It doesn't require me to shop in that store, but at least I have the option if the deals offered are attractive enough. Credit cards with no monthly fee also come under this category, though I'm not a fan of accumulating many credit cards as a general rule. When there's no yearly renewal fee. If I need to pay a specific amount per year for the "privilege", the card is usually not worth my while. When you're able to recoup the cost of the card in savings when making your first one, maximum two, purchases. If you need to shop multiple times to cover the membership fee, that means so many shopping trips you're obligated to make at that particular store. Unless you're 100% sure you'll actually want to shop there that many times, pass on the offer. Payz (the link is to the app's website, which contains app downloads for both iPhone and Android) is an app in which you enter any and all credit cards, membership cards and vouchers you possess. Then, you can look up local businesses and see which of them can be used at a given business, and under what conditions. This can assist you in your decision where to shop. Re-member is an iPhone-only app (unfortunately, as it looks to this Android user to be really cool). You input all your membership cards, and instead of producing the card at the cash register, cashiers can scan the card directly from your phone. This lightens your wallet considerably, as you don't have to stuff your wallet with all the physical cards. Cardsapp is a US-based app (the other two being homegrown) which works on the same principle as Re-member, but as it only contains very few Israeli businesses, and not the most popular ones either, at this stage, I would think that its usefulness is limited for most Israelis. But it's probably worth a trial download just to see if you, personally, can benefit from it.